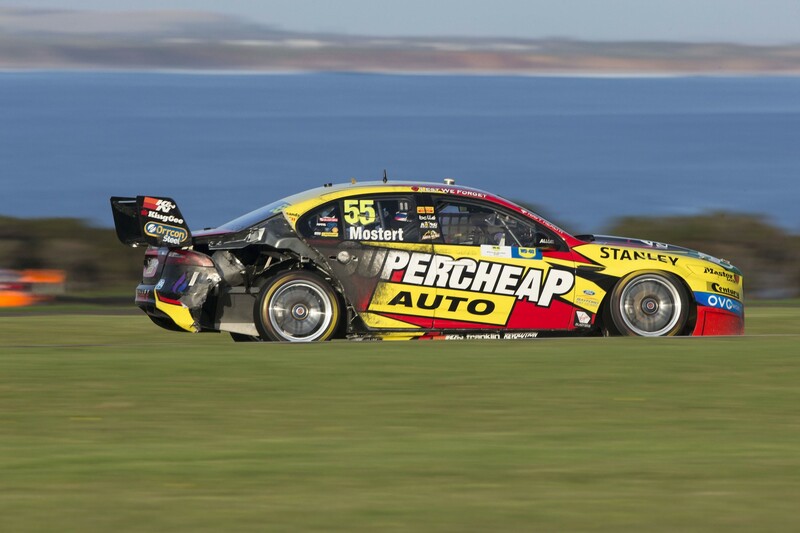 Supercars and Dunlop are this evening undertaking a full analysis of tyres from today’s opening race at Phillip Island before deciding whether any measures need to be taken ahead of tomorrow. A spate of right-side tyre failures struck during today’s opening 250km race as the new-for-2017 Dunlop tyre made its debut at the punishing, high-speed circuit. The Supercars Commission, which includes team principals Brad Jones, Tim Edwards and Todd Kelly, held a special meeting in the paddock post-race to discuss the issue. A second Commission meeting is due to be held tomorrow to decide whether any measures need to be taken before the second 250km race. Supercars already has a minimum 17 psi tyre pressure rule, but does not stipulate a maximum camber setting. Three cars suffered right-front failures during yesterday’s Phillip Island practice, while the majority today were right-rears. “Supercars and Dunlop will conduct a full investigation into the tyre issues from today’s race,” Supercars Sporting and Technical Director David Stuart confirmed in a statement. Edwards, whose Prodrive team was the worst hit with failures for Chaz Mostert, Cameron Waters and Jason Bright, stressed that a full analysis is needed before any decisions are made. “We’ve got to get all the facts and figures together. We can’t make any decisions until we’ve got that,” Edwards told Supercars.com. “If teams that were having failures were running 3psi less and one degree more (camber) then teams that weren’t then clearly that’s down to the teams. “We took a very conservative approach today, but how conservative do you have to be? That’s the answer that no one really knows. Drivers and teams naturally push the boundaries. “We’ll certainly look at our set-ups between the cars. It’s one thing talking bout static camber but the geometry you run has implications on how much camber it takes on through its range of motion. Prodrive was scheduled to run a test of the 2017 Dunlop tyres with Supercars at Phillip Island midway through last year, but the day was rained out before any track running could be completed. “It would have been good to run the tyres here but we’re all masters of hindsight,” said Edwards of the situation. “We went to Eastern Creek which is another high-load circuit and had 26 cars running without a problem. After suffering two failures during Friday practice, Triple Eight was the only major team not to be stung by tyre issues today. Finishing second to Fabian Coulthard, who had an early blowout before storming back to the win, Jamie Whincup said it’s up to the teams to decide how much risk they want to take. “Motorsport is about driving to the conditions,” he said. “You can be ultra-aggressive on the set up and driving style and you can roll around with no dramas at all or you can be conservative and be kind on the tyre and not blow any out. “Should the category make it so that they you can’t get it wrong? Maybe. Maybe, that is why the tyre rule come in with the 17psi to stop teams running to close to the limit.